Paul Stevens was joined by his daughter Melissa and long time friend and fishing companion Billy Ronk today and we headed out to get Melissa her first marlin. As usual the Galapagos Island bite delivered and we had her first striped marlin (250lbs) at boat-side less than an hour after dropping our lines in. She had her second fish less than an hour later. Billy was up next and he brought in a monster striped marlin which was close to 300lbs on a 30lb Penn International loaded with 50lb Berkley Big Game mono. I am now completely convinced that the only mono I will ever use is Big Game. We shot some amazing video that showed just how much pressure you can put on a fish using 50lb line in a 30lb reel. 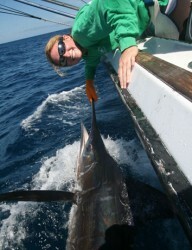 When we caught his fish we had more than a dozen striped marlin in the spread. We hooked another fish which jumped off and missed at least two other strikes. This all happened in less than a minute. The bite was very similar to what we saw all of last year. We were approaching a bait ball and never quite made it there. We spent the rest of the day working a very small patch of water with several other boats and hooked several more striped marlin before heading home. We are heading back tomorrow. My choice for fishing here are either 50lb outfits loaded with 80lb line, or 30lb outfits loaded with 50lb line. Line capacity is really not an issue. The boats are nimble and the fish rarely dive deep. If you used any lighter tackle, the fights would be too long and too tough on the fish. We really want to get these fish to the boat as quickly as possible, get our lures back, and send them on their way to fight another day.